After reading the ingredients in Surya’s rice cereal, I decided to take action. No more powdered cardboard for my baby. If I expect her to eat the food we eat when she’s old enough to eat what we’re eating, then I better start building her palate now. So I’ve been literally building it – one layer at a time. I’m following a single ingredient approach to isolate and identify any possible allergic reactions and waiting a few days between each new food. Beyond that though, all I needed was a reminder from Deb at Smitten Kitchen to go with my gut on what’s okay to feed my baby, and I was off. I get teased by friends about how much of my free time is spent thinking about food. I think about grocery lists in the shower…read Mark Bittman’s How to Cook Everything on the subway home…lay awake at night wondering whether grilled apples are the right pairing for salty haloumi cheese (they are). My recent food obsession has been – not shockingly – which new foods to introduce to Surya. Different, new combinations I can make for her to bring her one step closer to enjoying all of the foods her daddy and I enjoy. Most importantly though, I’m trying to create dishes for her that mimic the foods we eat. Because as fun as it is to make her “special food” now, my goal is for her to one day eat what we eat. So, of course, we need her to love mattar paneer. And while she can’t have paneer just yet, peas were one of the first foods she developed a love for…whew. 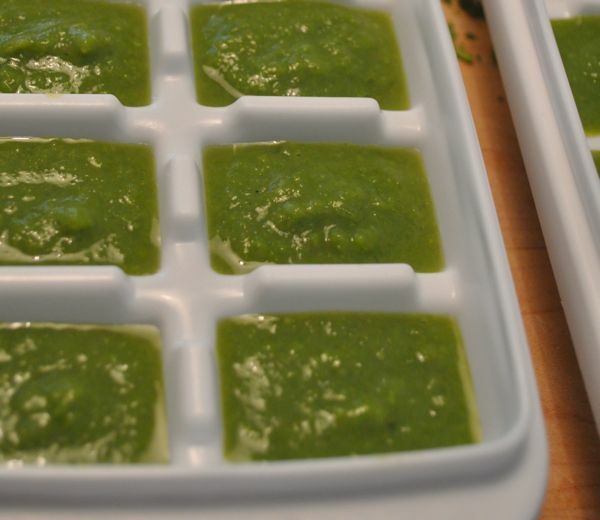 You can make a batch of these and puree a portion for the baby. Add a little sprinkle of salt to your bowl (no extra sodium needed for the baby’s peas) and you’re all set. Teeny diced potatoes would be a great add to these peas as well…for both you and baby. See below for more “add in’s”. Mix the peas, water and cumin and coriander powders together in a small saucepan. Bring to a boil then reduce heat and cover. 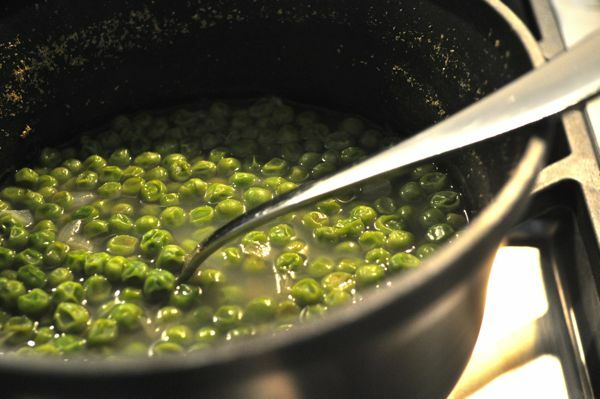 Cook for about 5-8 minutes until the peas are soft and a slightly dull green. 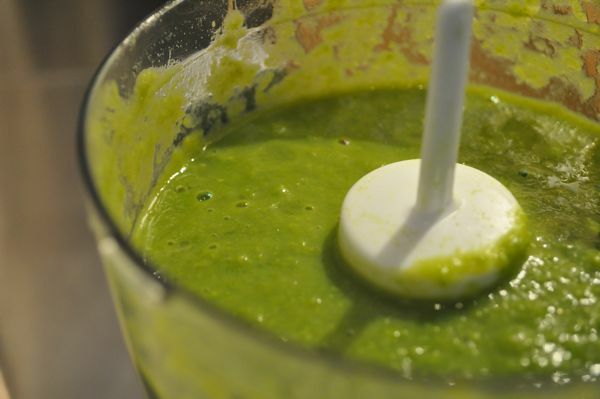 Let the baby’s peas cool then puree in a food processor with a little bit of the cumin-coriander water. Storage: I freeze the rest of the pureed batch for easy dinners for Surya. These peas go really well with other mini meals I’ve been preparing for her – potatoes, sweet potatoes, broccoli or just with a few tablespoons of yogurt…even the dreaded rice cereal. Add-in’s: You can try adding a teeny tiny sprinkle of red chili powder (if you think you’re little one can handle it) to go up against the sweetness of the peas. You can also add in peeled, diced white potatoes (dice them small so they boil quickly) or roughly chopped sauteed onions and/or tomatoes. My method for introducing these was to serve up the peas plain first, then a few days later add in the cumin/coriander then maybe a few days later the other veggie (potatoes, tomatoes or onions). Nice , new to me.. Reminds me of those good old days!!! Try adding turmeric…my little ones loved it. @tibik – that’s a great idea for a next new spice to introduce. thanks! I used to take regular oatmeal and process it until very fine in the food processor for their oatmeal cereal…same with rice. I liked knowing what was in their food. @Jessica – Thanks for the comment! That’s a great idea with the oatmeal and rice. I would love to hear some other things that were big hits. Thanks for the page, I have it bookmarked on my computer. I have a sixteen year old son and a ten and 1/2 month old daughter. With my son I used only store bought baby food. Poor baby, back then it probably did not taste too good. With my baby girl I make almost all of her food. Everything I make for her, passes my taste test. It feels so good to cook wholesome and healthy food for her. Your recipes have inspired me to get creative with my baby cooking. Sometimes is works, sometimes it doesn’t:-). Thanks so much for your comment. It’s very sweet of you! I just started a new website with another mom a few months ago, Half Pint Gourmet, that’s focused on kids and baby food. Check it out and let me know what you think. We’re running a contest for your favorite baby purees. Would love to have you add a recipe.